Multi-millionaire Tory Zac Goldsmith today gave Londoners a glimpse of his fortune when he published details of his tax bill. 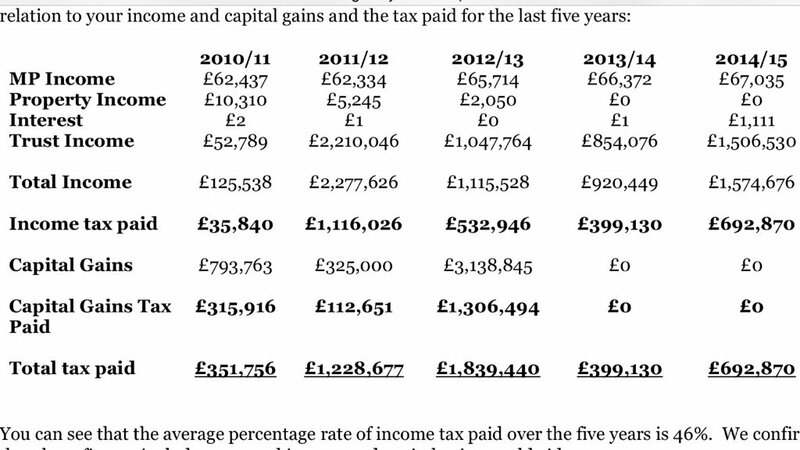 The old Etonian candidate for London mayor paid more than £4.5m tax between 2010 and 2015. A letter from his accountant revealed an income for the same period in excess of £10m. His wealth came in the form of payments from a family trust fund, his MP's salary, property and capital gains. Goldsmith, the MP for Richmond Park, said he was honouring a commitment to publish his tax returns and called on rival candidates to follow his example. As was well known to voters in my two elections as an MP, I became ‘non-dom’ automatically because of my father’s international status. It was not a choice, and I relinquished it seven years ago. I was born, grew up and have always lived in London - except for two years travelling abroad in my early 20s. Because of this I derived very little, if any, benefit from this status as my income came to the UK and was therefore taxed here. It is no secret I was dealt a good hand in life, but I have been determined to play it well. I have stood up for my local community in Parliament for six years, delivering on my promises to them - which is why they returned me with one of the biggest increased majorities at the last election. I am proud of my record and I will stand up and deliver for all of greater London, just like I have for Richmond, should I be elected mayor in May.